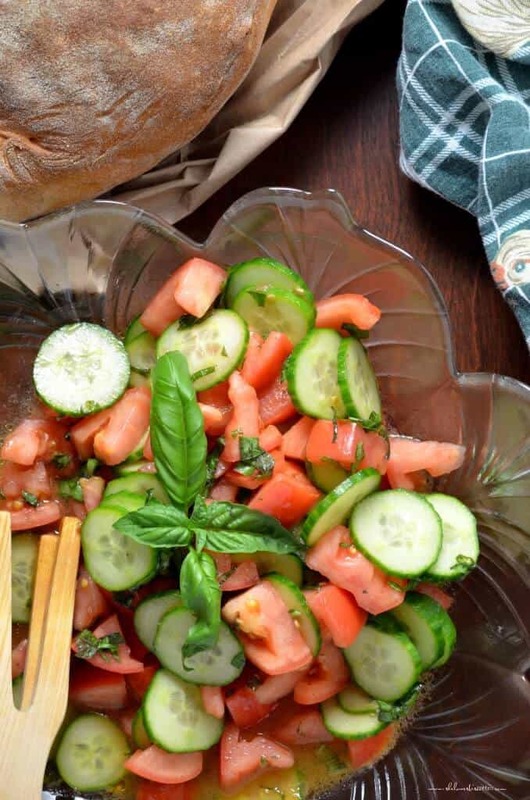 This recipe for Italian Tomato Cucumber Salad is so ridiculously simple to put together that it’s hard to believe how flavorful and tasty the final product is. In any recipe, the freshness of the ingredients will definitely have a major impact on the final product. The general rule of thumb is that fresher is better. One great way to ensure freshness is by buying locally grown produce. It makes sense right? The travel time is shorter. If you also factor in the benefits for the environment (reduced gas emissions and support for your local producers, for example), buying local makes a lot of sense. Another way to ensure freshness is to grow your own vegetables. Growing up Italian in Montreal meant being exposed to a lot of backyard gardens, and I am lucky enough to have one myself. Personally, I think the garden was definitely a way for my grand-parents and parents to preserve their identity and their connection to the rural life they lived in Italy, and I realize now that growing your own fruits and vegetables provides a great sense of well-being. Most Italian families I knew would grow their tomato plants from their own seeds. I can still remember how, at my parents’ house, these tiny seedlings were placed right next to the patio door – it was the area that had the most sunlight in the spring and so, naturally, was reserved for the tomatoes until they were transplanted outside. As the days got longer and warmer, these tiny plants would be placed outside in direct sunlight during the day and transferred back inside for the evening. This was definitely a labour of love. Bottom line is that a freshly picked tomato really tastes like nothing you will find in a store. Did you know that you can also grow tomatoes in containers? Fine Gardening has a great article on the subject here. So, even if you live in an apartment, or a condo, you can definitely grow your own tomatoes! So, if you’re familiar with my blog, you probably know that a lot of my “traditional” Italian recipes were inspired by my mom. 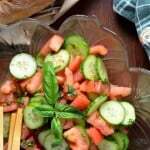 Every family – and I mean every family – I know has some variation of this Italian Tomato Cucumber Salad. There were some that added thinly sliced onions or even grated garlic; you would find different proportions and types of herbs; different varieties of cucumbers and tomatoes; sometimes you’d even find olives. My mom liked to keep things simple and so the list of ingredients was short. Remember, when you’ve finished eating the cucumbers and the tomatoes, you have to be quick to dunk a nice slice of pagnotta (this is a rustic peasant loaf of bread) in the tomato-oregano infused vinaigrette left at the bottom of the bowl. 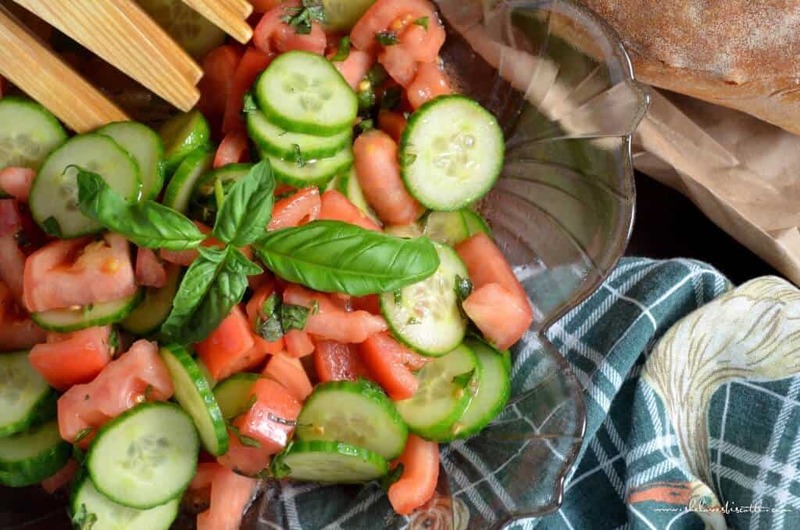 Whether you are making this Italian Tomato Cucumber Salad from the vegetables you’ve grown in your own garden, or gotten from your local farmers, or bought at your favourite grocery store, there’s no better time than now to enjoy this wonderful salad. This recipe for Italian tomato cucumber salad is so ridiculously simple...and the best part is dunking your bread in the tomato-oregano infused oil. Combine chopped tomatoes and cucumbers in a large bowl. Place the rest of the ingredients in bowl and whisk together. Pour dressing on salad and toss gently together. Nothing beats a garden fresh salad! Love it!!! Nothing nicer than fresh, home grown vegetables. They always taste the best, I think it is the love that goes into growing them. Great recipe Maria! Nothing better than simple, fresh, local (or better homegrown) produces to create a tasty, healthy, satisfactory meal! We just helped my in-law’s to bring the tiny tomato plants outside in the hothouse, waiting to grow bigger and plant them on the ground 🙂 . Beautiful recipe and beautiful pictures, Maria. Ciao! I’ve always enjoyed the combination of tomatoes and cucumber. This looks like a great way to do it! I’ve pinned it to try later. I agree there is nothing like the taste of fresh grown vegetables, especially home grown tomatoes! This salad looks like the perfect summer side dish…adding it to my list of must-makes!